Mushrooms have to be one of my favourite ingredients to cook with – they can never be overcooked, and take on all flavours. We are very lucky in that we can easily and readily get exotic mushrooms. These are grown locally in Stellenbosch which is a farming area close to where I live. These are sold in all our local supermarkets. 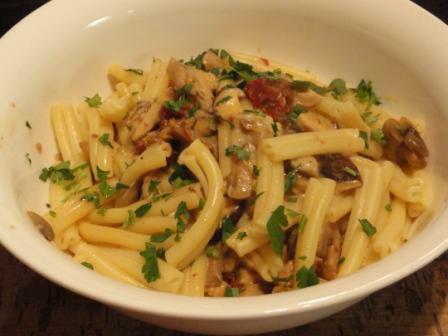 With them I have made Exotic Mushroom Pasta With Sun Dried Tomatoes. Only saw your recipe now. Hope you don’t mind me posting it on our blog. Definately going to try this out. Lovely! You should submit this to the Kapruka website so they can post it in their section of recipes that feature coconut oil. Simple dish, but really quite luxurious.